Janus Capital Management – In the third quarter, Janus Capital Management increased its stake in SCTY by 29.2%, bringing the total number of shares owned to 752,999 with a total value of around $32.158 million. Tocqueville Asset Management L.P. – In the last quarter, Tocqueville Asset Management purchased 18,765 shares, bringing its total number of shares to 263,563 for a total value of about $13.447 million. Zurcher Kantonalbank Zurich Cantonabank – In the fourth quarter, Zurcher Kantonalbank Zurich Cantonalbank raised their stake in SCTY by 38.3%, bringing the total shares owned to 203,154 for an estimated value of $10.365 million. As investors, we know that the news moves the market. When day to day investors start to see smart money getting involved in a stock, it’s definitely good news. After all, smart money makes money! 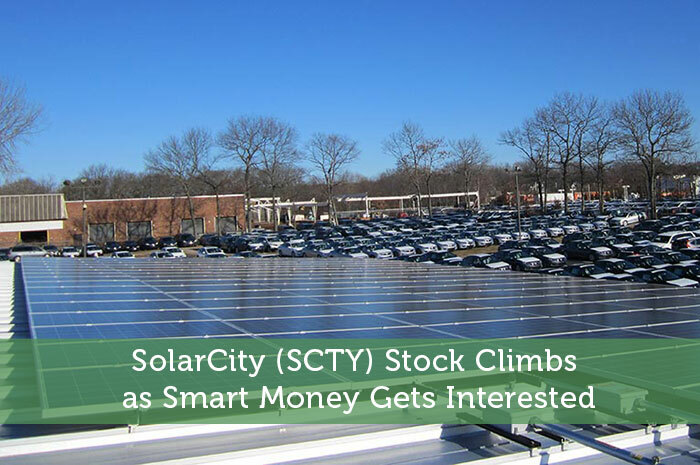 So naturally, after seeing reports of such big stock purchases by major hedge funds, investors are quite excited, and they’re pushing the value of SolarCity upward in a big way today. Currently (2:05), SCTY is trading at $22.47 per share after a gain of $3.01 per share or 15.47% thus far today. Moving forward, I have an overwhelmingly bullish expectation with regard to what we can expect to see from SCTY. First and foremost, smart money follows big money. With so many hedge funds and asset managers getting excited about SolarCity, this alone is a clear reason to start getting involved in the stock. However, it’s not the only reason I’m so bullish on SCTY. The truth is that the company is one of the largest in the solar industry, and the world of energy is changing. Ultimately, global warming is becoming a bigger and bigger problem. So big in fact that Paris recently reached a climate change deal with 195 countries who have agreed to reduce greenhouse emissions. To do so, these countries will have to reduce their reliance on fossil fuels, which will lead to higher demand for solar and other renewable energy. So naturally, companies like SCTY are likely to benefit greatly from the coming trends in energy. I think these sort of investments are very good long term plays. It is obvious that the future of energy is in solar! Especially once people start to understand we have no choice. We need a carbon negative society 20yrs ago. Arctic Methane Emergency! Ps. Ya, I own shares, but I also don’t drive, eat organic, and intentionally live a mile from my min. Wage job. People don’t change their lives over meaningless information. Money is a tool and it’s time we have a mass awakening. I am fighting for industrial hemp too!